The following summary data is from the government-wide Statement of Activities in the City’s Comprehensive Annual Financial Report. The government-wide Statement of Activities reports the results of the of the City’s operations on an accrual basis of accounting. Revenues are recognized when earned and expenses are recognized at the time the liability is incurred. The per capita figures are based on the City’s 2013 estimated population of 10,739. A budget serves as the financial plan for the City. It shows proposed spending and revenue in broad categories by department or by account type. 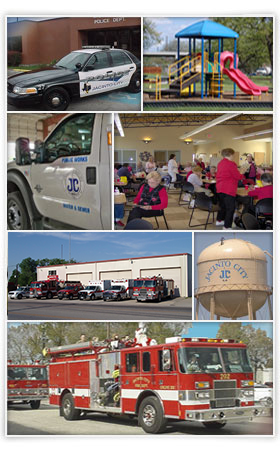 The City of Jacinto City’s Budget cycle begins on October 1st and ends on September 30th each year. Summary Financial Statements present the major operating funds of the City on a budget basis which approximates a modified accrual basis of accounting. These statements are prepared as a tool for management to identify any trends that need to be addressed. A check register is a listing of all payments incurred during a quarter by the City. The check register includes payment date, payment amount, payee, type of expenditure, and business unit. Investment Officer’s reports provide information and analysis on City investments in accordance with the Texas Public Funds Investment Act. Summary information about outstanding debt including debt obligations, descriptions, dates issued, total amounts and maturity dates. Debt service schedules for all outstanding General Obligation Bonds, Certificates of Obligation and Revenue Bonds.